This is the second I have visited this year of the approximately seven extant Campos Tacos locations, following the one on Jefferson in Culver City. Though seemingly in decline now, a result of changing tastes or demographics, perhaps, Campos is still the primary chain restaurant for cheap conventional tacos serving the greater Westside. 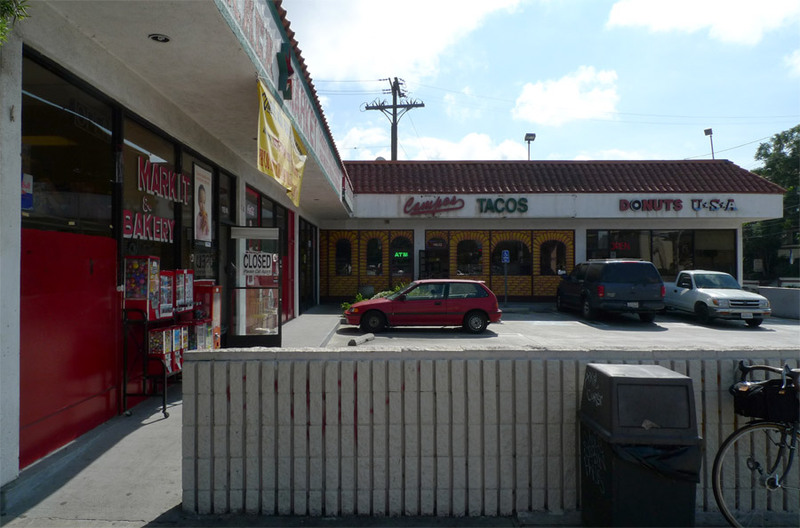 Though it is in relatively upscale Mar Vista, this tiny and dilapidated corner strip mall with its carnicería, donut shop, and Campos outpost is a holdout from the working-class culture that still thrives in the dingbat-rich sectors of Mar Vista. I arrived at about 11:45 for an early lunch on a Friday and found Campos to be serving a working-class clientele. The man who arrived in a white utility-bed pickup never took off his hardhat, and all of the dozen other customers I saw looked like tradesmen and laborers. The food at Campos matched the down-to-earth environment of the restaurant – it’s precisely the kind of filling, inexpensive, hearty food that one might want after a long morning’s work. 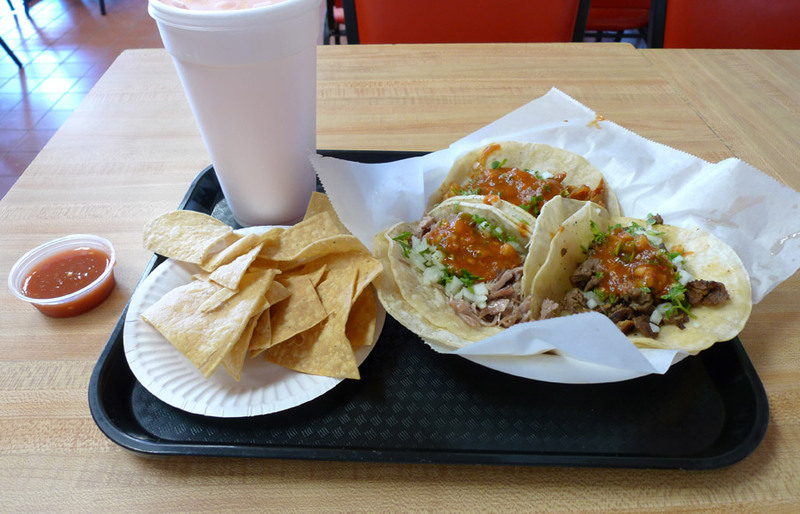 I ordered combo #1, the three soft tacos and a fountain soda, which was $7.08 including tax. Confusingly the extensive and old-school handwritten menu board listed tacos in two places, $1.25 in one place and $2.25 elsewhere. Two different size tacos are available, perhaps. My combo came with tacos that were pretty huge. Sitting down to three of them is a righteous meal for a meat lover. They were served fairly quickly, and looking at them I didn’t have very high expectations, but my expectations were exceeded. I started with carne asada. The tortillas were pretty good, oversized and doubled, very lightly oiled and griddled. The carne asada was minimalist in its seasoning, tender and moist – better than expected. Purist, to use a word of which Diana recently reminded me. Sitting in the big, under-occupied dining room, while watching a television program on which guest Melissa Rivers poked fun at the fashion choices of celebrities, I enjoyed big, meaty bites of this taco one after the other till it was gone. The salsa from the bar was bland, in contrast to my hopes of discovering something like the invigorating grapefruit-habanero salsa they have at Campos Famous Burritos on Venice at Motor, but the rojo on the tacos seemed a bit stronger. Next I ate the al pastor. It is of the saucy variety, fruity and sweet with lots of grilled onions, leaving a viscous orange liquid dripping from the back of the taco. Pretty tasty. Unfortunately, Tacos Leo has ruined me by abetting my transformation into an annoying modern-jackass al pastor snob. Tacos Leo, incidentally, has now hit the big time – the new issue of Los Angeles magazine featuring local Mexican food has a paragraph that defines al pastor and cites Tacos Leo as the place to get it. Will ordinary gringos start to feel comfortable eating there? I selfishly hope not. But I digress. It’s darn hard not to digress to thoughts of Leo’s when you’re thinking about tacos. Finally I ate the carnitas. It was of the grey and moist variety, unlike the Campos on Jefferson, but quite good for a grey and moist carnitas. I was looking at it and eating it thinking, huh, I’m actually enjoying this. It had strong pork flavor and was salty without being too salty, a bit like good luau-style kalua pork. Surprisingly, my meal of three giant tacos at Campos left me feeling great afterwards too.